This low cost 4WD outdoor mobile robot platform kit is perfect for the robot enthusiast looking for an outdoor mobile robot platform, but does not want to spend too much money. The kit comes complete with 4x gearmotors, outdoor wheels, aluminum frame and mounting hardware. The two plates include space for a standard sized servo motor. To complete the kit, you would need a dual motor controller and a receiver or microcontroller. The 4WD four-wheel-drive robot chassis is a platform for independent research and development. When compared with traditional 3-driven platform, the 4WD use 4 independent drive motor, which makes it more powerful and provide climbing ability for outdoor applications. 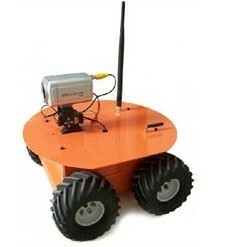 Get 4WD Outdoor Mobile Platform from DFRobot Store or DFRobot Distributor.